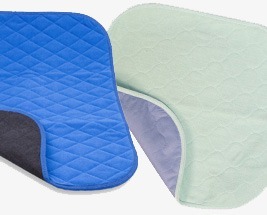 Our comprehensive range of chair pads offers value and protection with both disposable and washable products. Our disposable chair pads contain virgin fluff pulp in a diamond-shaped wicking to spread absorption across the pad; with a polyethene backing for extra protection. The washable chair pads are available in a range of designs and colours and are a comfortable and stylish option to protect your furniture. If you are looking for larger pads suitable for beds please see our Washable and Disposable Bed Pads range.